The Marine Globe Logo centered on a Black License Plate. 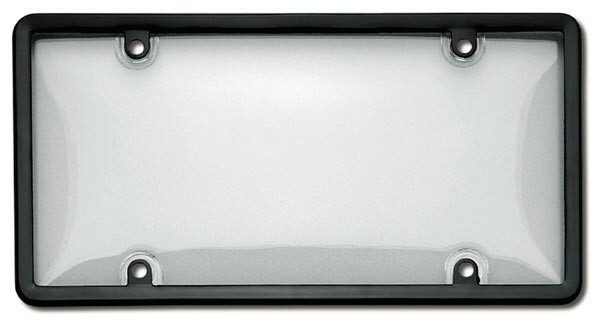 The Marine Globe Logo centered on an Black Diamond Plate License Plate. The Marine Globe Logo centered on a Black American Flag. 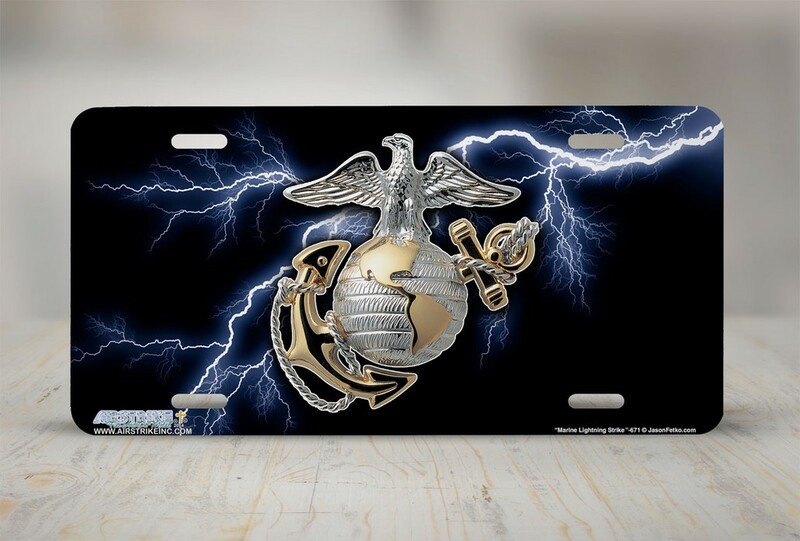 The Marine Globe Logo on a Black License Plate with lightning in the background. 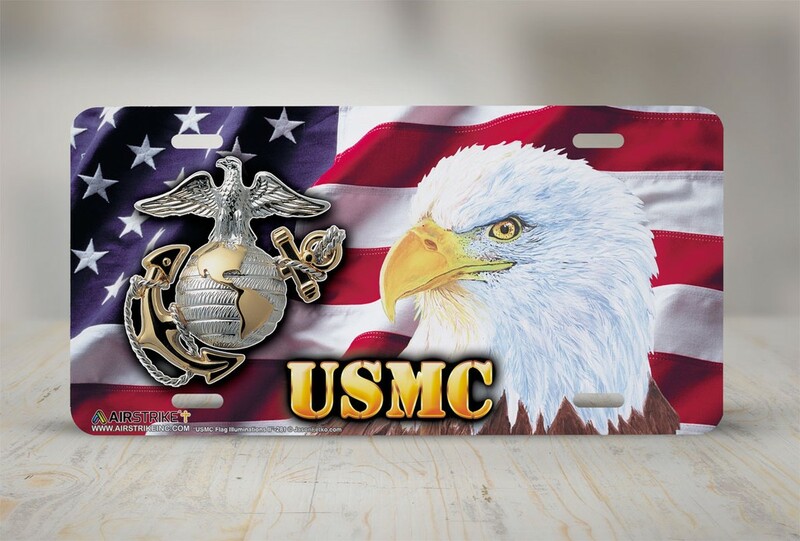 The Marine Globe Logo on the left with USMC centered and the Bald Eagle on an American Flag License Plate. 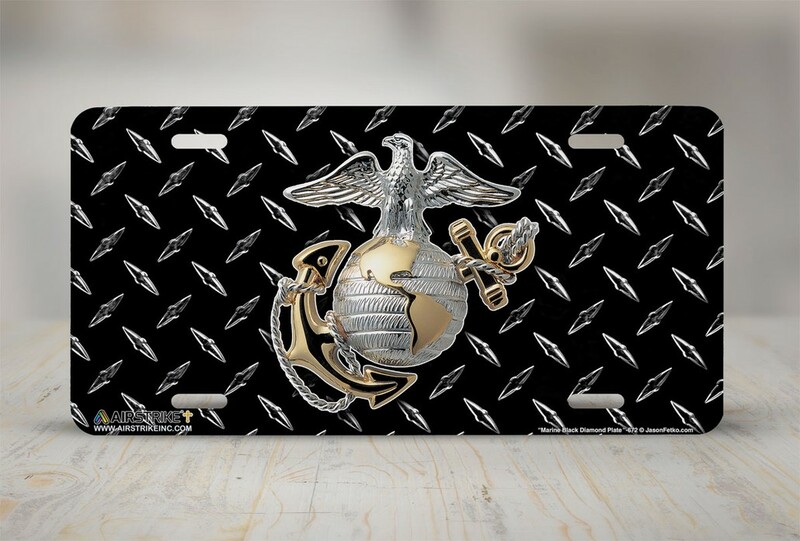 The Marine Globe Logo on the left with USMC centered and the War Memorial on an American Flag License Plate. 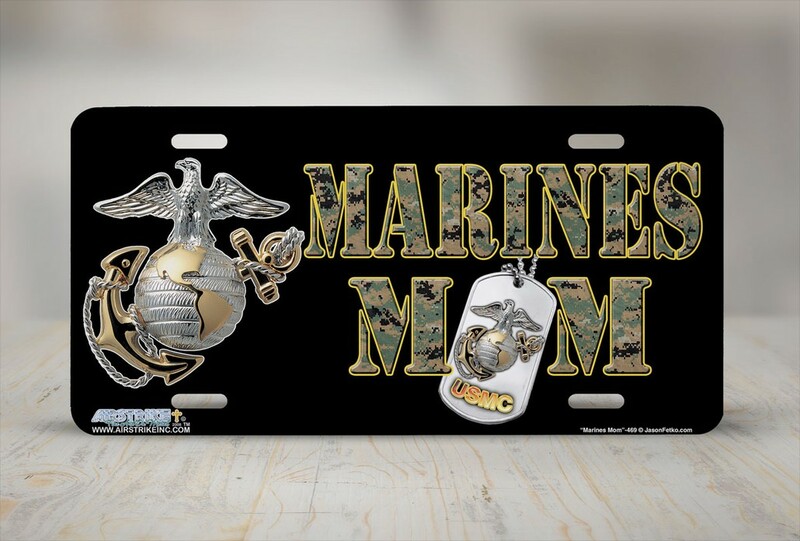 The Marine Globe Logo on a Black License Plate with Marines Mom. The Marine Globe Logo on a Black License Plate with Marines Dad. 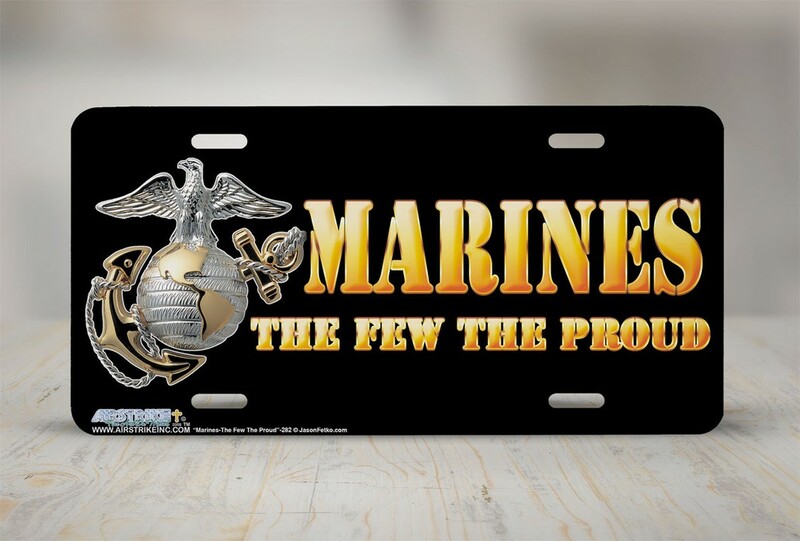 The Marine Globe Logo offset on a Black License Plate with "The Few The Proud". The Marine Globe Logo on a American Flag with Retired. 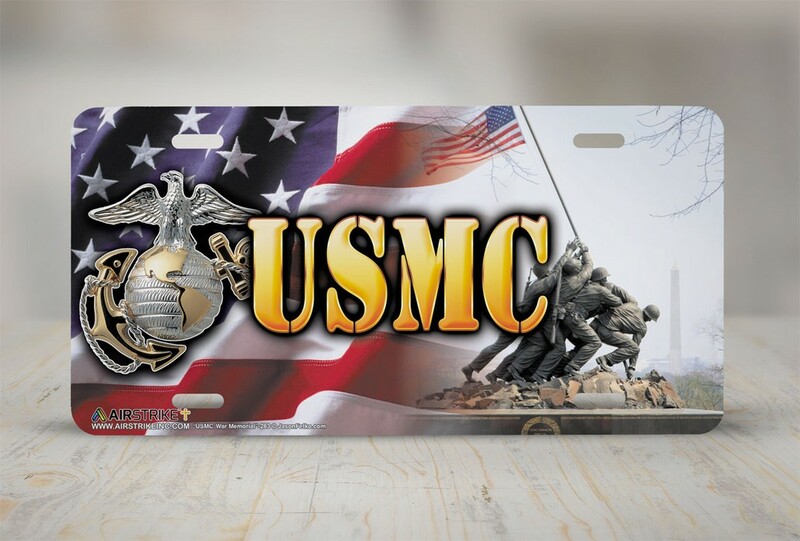 The Marine Globe Logo centered on a License Plate with Marines in Action. 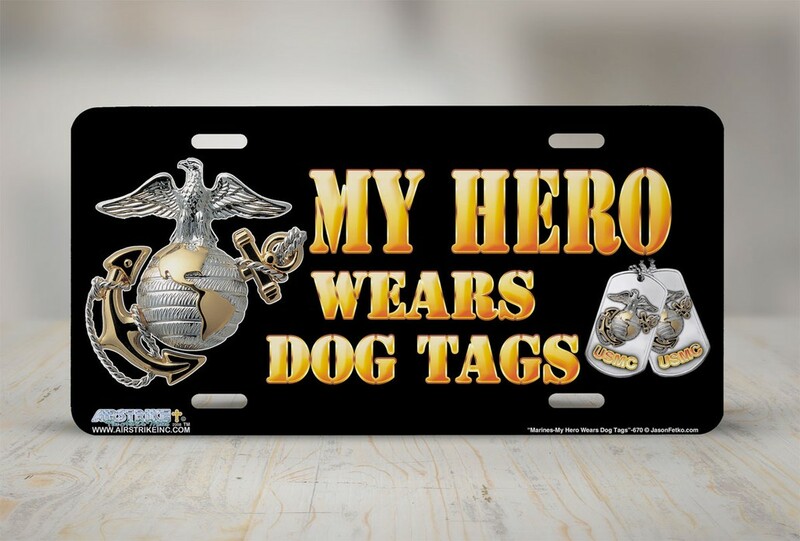 The Marine Globe Logo on a Black License Plate with "My Hero Wears Dog Tags". 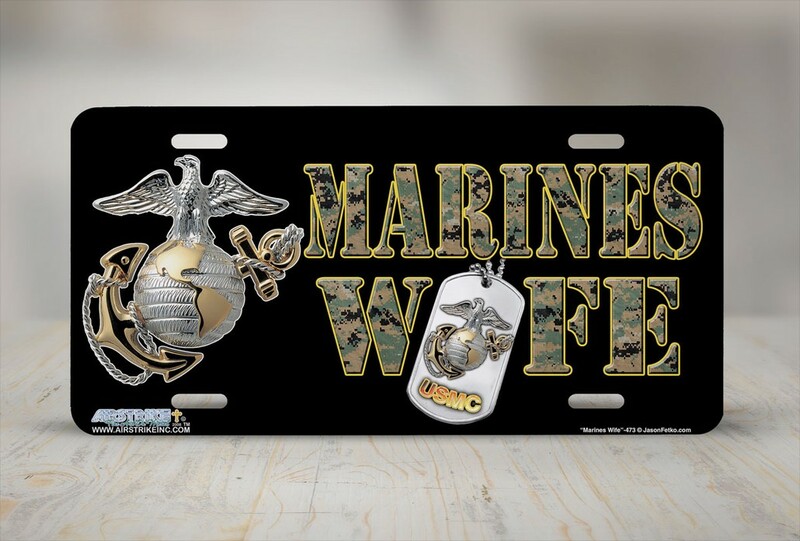 The Marine Globe Logo on a Black License Plate with Marines Wife. 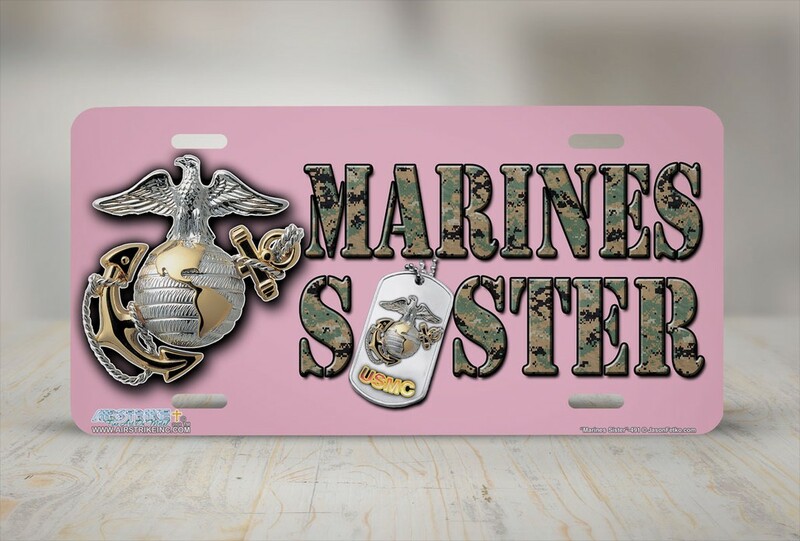 The Marine Globe Logo on a Pink License Plate with Marines Sister. 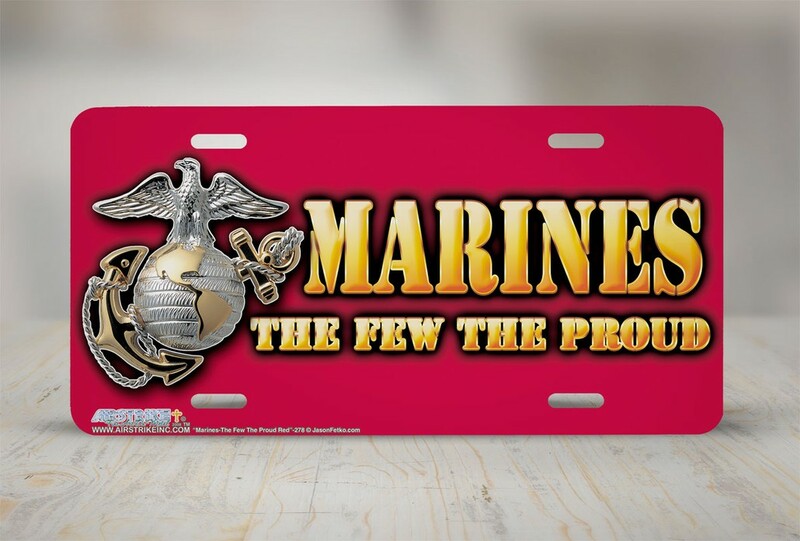 The Marine Globe Logo offset on a Red License Plate with "The Few The Proud". 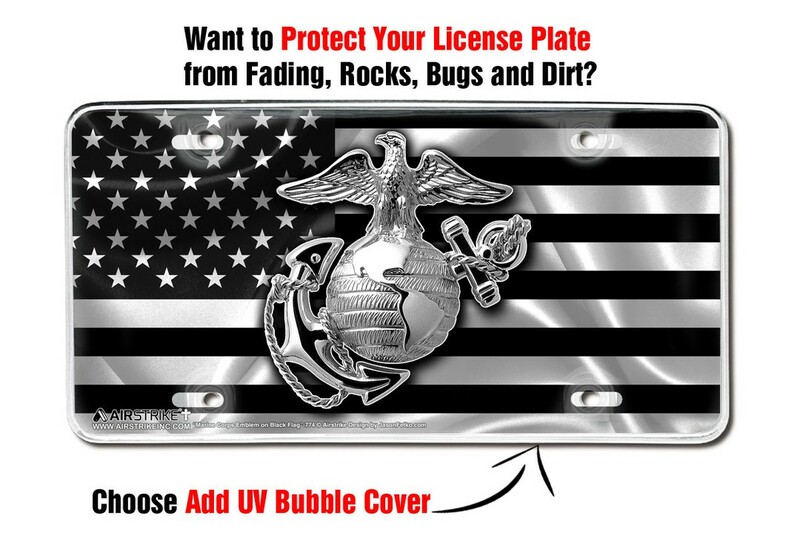 Showoff your Marine pride in style! 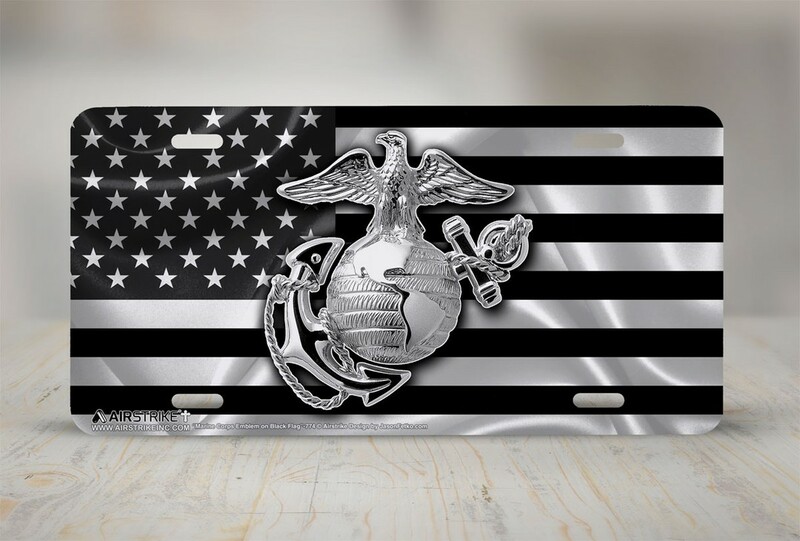 THIS USMC BLACK FLAG LICENSE PLATE SHOWS YOUR MARINE PRIDE WITH STYLE. Use this license plate to show off your pride in style in the best way you know how on your vehicle. 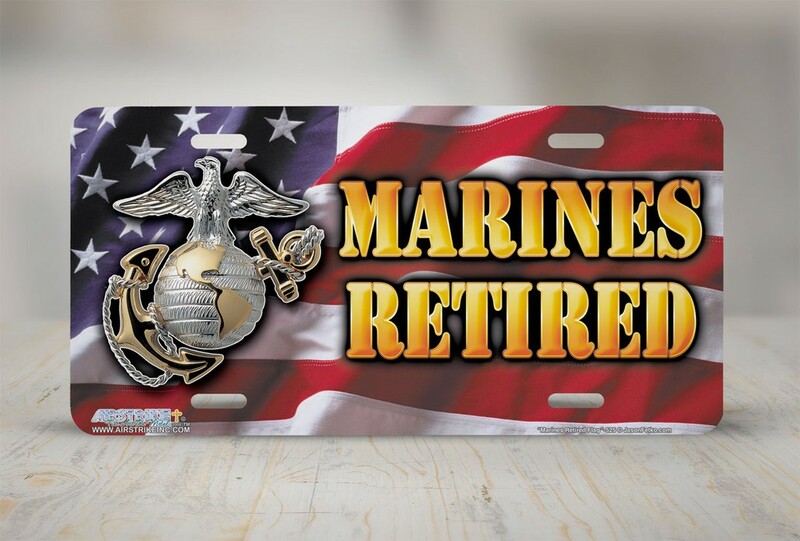 So that when you are riding around town, you always will have an emblem of Marine pride. This way everybody can see you and know that this is someone who values the Marines and honors them and will remind them to do the same. 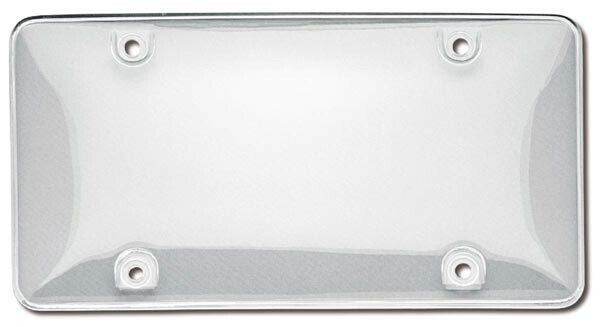 THIS CLEAR PROTECTIVE BUBBLE COVER WILL PROTECT YOUR PLATE FROM FADING, ROCKS, BUGS AND DIRT. The clear U.V. 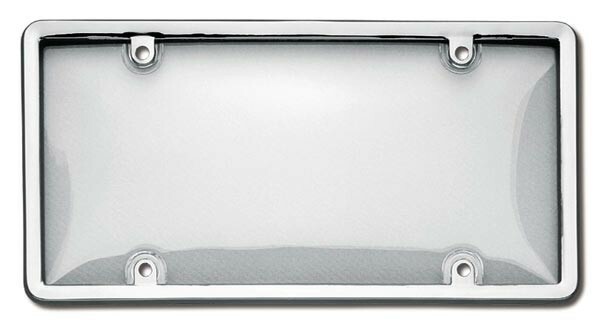 acrylic extends away from your plate, keeping your plate looking clean and new. This protects against rocks, bugs and dirt. The Ultra Violet protection means that this shield wont yellow or crack from the sun’s harmful rays. SHOW OFF YOUR MARINE PRIDE IN STYLE WITH THIS LICENSE PLATE. 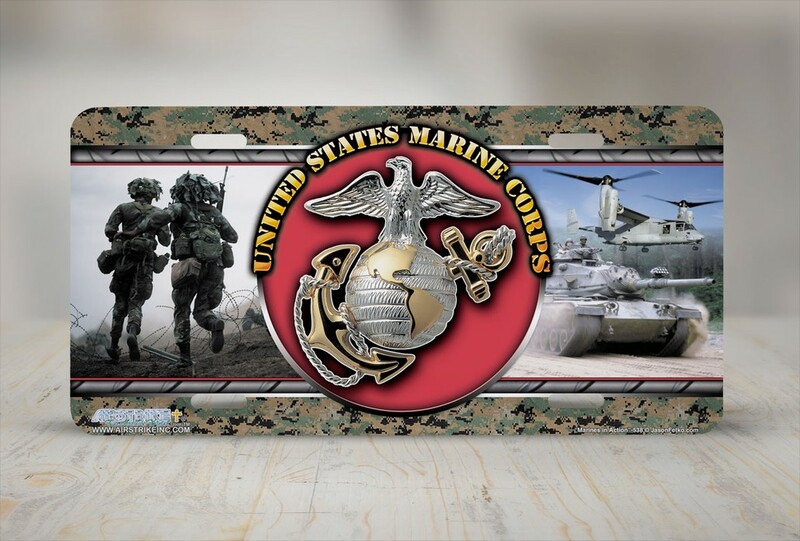 We are so grateful for the Marines that serve our country day in and day out. Whether that is you or someone you know, show off your pride in style in the best way you know how on your vehicle. So that when you are riding around town, you always will have an emblem of Marine pride. This way everybody can see you and know that this is someone who values the Marines and honors them and will remind them to do the same. What are people saying about Airstrike? Fine Art that Makes Your Ride Look Good. Join the AIRSTRIKE CLUB for new videos, discount codes, and more!